While we eat, work, and sleep, bees are busy around the world. More than 20,000 species are in constant motion. They pollinate plants of all types and keep our natural world intact. In "Bees," you'll find a new way to appreciate these tiny wonders. A comprehensive guidebook for gardeners, small farmers, orchardists, beekeepers, naturalists, environmentalists, and public land managers on how to protect and encourage the activity of the native pollinators of North America. 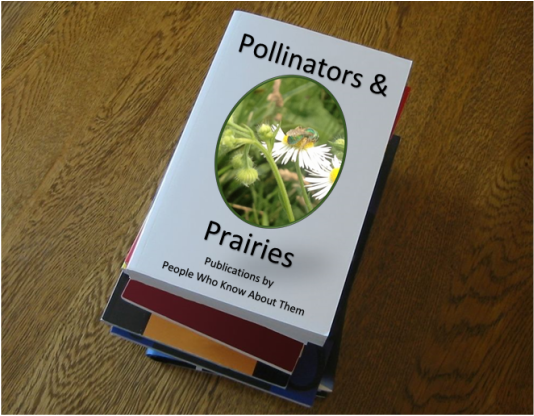 Written by staff of the Xerces Society, an international nonprofit organization that is leading the way in pollinator conservation. Responsible for pollinating over 110 different crop types throughout the world and accounting for a quarter-trillion dollars' worth of commerce, the incredible efforts of the honeybees are vital to humanity in terms of the food we eat, the clothes we wear and the medicines we use. And yet, all around the globe, billions of honeybees are dying from colony collapse disorder, the effects of global warming, introduced mites, bacteria, fungi, diseases and modern insecticides. Our civilization as we know it depends on the health and well-being of all 20,000 known species of bees, and each of us is required to lend a helping hand to ensure that the bees survive. By focusing on one ecosystem, Prairie in Your Pocket is perfect for amateurs as an introduction to prairie plant identification. It is the only guide of its kind for identifying tallgrass species. The guide provides color illustrations along with common and scientific names, plant heights, and blooming periods for 114 species. Originally published in 1982, "Where the Sky Began, John Madson's landmark publication, introduced readers across the nation to the wonders of the tallgrass prairie, sparking the current interest in prairie restoration. Now back in print, this classic tome will serve as inspiration to those just learning about the heartland's native landscape and rekindle the passion of longtime prairie enthusiasts. Thirty-five years and many acres after planting his first patch of prairie flowers, Carl Kurtz is considered one of the deans of the great tallgrass prairie revival. The Prairie Enthusiast called the 2001 edition of his book a “readable and understandable introduction to prairie and the general steps in carrying out a reconstruction.” Now this second edition reflects his increased experience with reconstructing and restoring prairie grasslands.